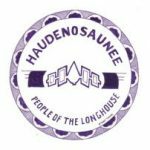 The Oneida Nation is part of the Iroquoian (or Haudenosaunee) tribes, which are originally known as the “Five Nations” (Mohawk, Oneida, Onondaga, Cayuga, and Seneca). Their homelands are primarily located in New York State (Central New York). In 1609, the population of all five tribes numbered about 5,500. In 1961, “many of the Five Nations people have been assimilated into the cities” (Ritchie), however, the majority still occupied reservations in New York and Canada. 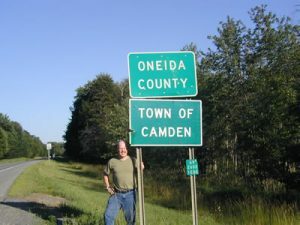 Around 1,800 people made up the population of Oneidas in Canada, while only 469 lived in New York, as an enumeration from 1961 has shown (Ritchie). According to Kandice Watson, Director of Education and Cultural Outreach for the Oneida Indian Nation, today there are three Oneida Indian nations in North America. Two of them are in the U.S. (New York and Wisconsin) whereas the other one is in Oneida, Canada, living independently from one another. 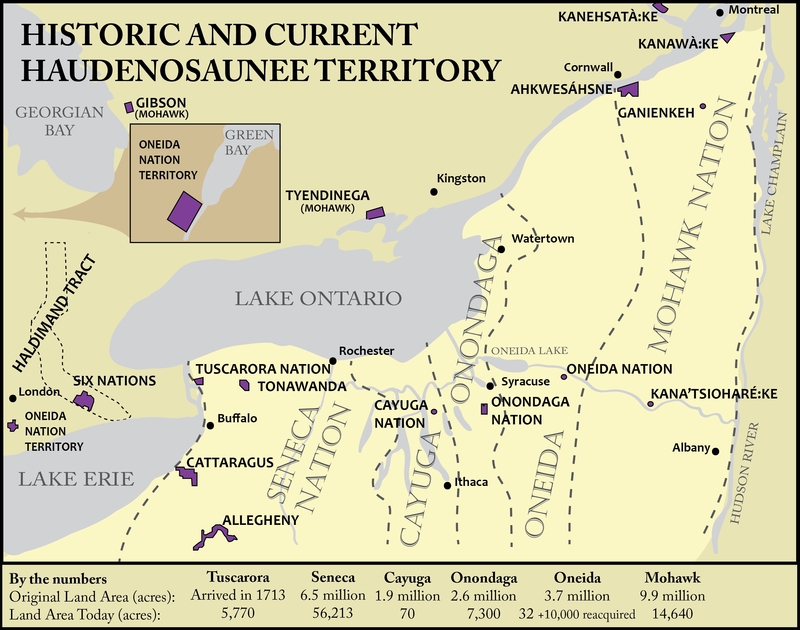 During the Revolutionary War of 1812, “[t]he Oneida Indian Nation sided with the patriots, while all of the other Haudenosaunee nations sided with the British” (Watson) and making the Oneida Indian Nation known to be America’s first ally. 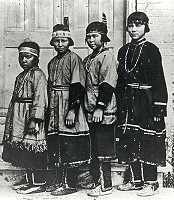 The website oneidaindiannation.com states that by “the early 1900s, illegal state treaties nearly depleted the Oneida Nation of its homeland. […] Some moved, some sold their land. The Oneidas had to fight to recover the last 32 acres granted to them. The federal government filed suit in U.S. District Court in 1919 to help the Oneida Nation reclaim this land.” Today, the Oneida Nation has claimed back around 13,000 acres of their former homeland. As Cora Elm’s representation of the creation myth only entails women (alongside the animals), as opposed to other representations, interesting to note here is the role of the woman inside the Oneida Nation. As reported by oneida-nsn.gov, the Iroquois people are a matrilineal society. Identity and family is inherited through the mother’s side, and an Oneida man would move into his wife’s family after marriage. Accordingly, children were members of the mother’s clan. The Oneidas have different clans inside their nation. 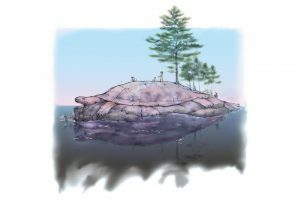 Most important for the origin story, the turtle clan “represents the shifting of the earth and the cycles of the moon.” Roberta Capasso wrote in her book “Sky Woman lives in Me” that “Turtle Clan members were keepers of the land. They also provided the well of information of the Oneida culture to others in the tribe.” In the story, the turtle is the one on whose back the earth is build. Important for the following critical commentary to address are the different representations I found of the creation story. This version of the story conveys the message that humans are “complex, possessing both good and bad qualities. The Creation story serves as a reminder: no human is flawless.” In this version, “the Great Spirit”, ripped a hole in the center of his realm. He told his daughter to peer through the hole to then carefully push her into the void. The animals see this “Sky Woman” and, just as in Cora Elm’s narrative, they were first afraid but then decided to provide a place for her to live. After she arrived on the land – North America – which the animals have created for her, she gives birth to twins. One of them turns out to be a good spirit, the other one an evil spirit. Sky Woman dies and the good spirit uses her remains to provide light, whereas the evil spirit created darkness, alongside other evil creations. Eventually, the two brothers end up in a fight, in which the good spirit wins and locks his brother into a cage under the ground. The evil spirit, however, still has “wicked servants who do his bidding and roam upon the earth. The wicked spirits are able to take any form and cause men to do evil things.” According to this, it is why mankind has both a good and evil heart. Another version, on the other hand, talks about how the Sky Woman, living with the other sky people in the clouds, noticed she was pregnant and told her husband. In a rage, he ripped out the tree, which represented the center of their realm, and pushed his wife through the hole. Then the story develops just as the former one, however, according to the website, the story is being told by the Iroquois people to express their respect and gratitude for the animals living on this planet. Without them, Sky Woman would have drowned. Finally, this long version of the myth describes how Sky Woman, once on land, gave birth to a baby girl, who grew up with “the wisdom of both worlds.” Later in the story, “the Spirit of the West Wind” impregnated her and she gave birth to twins, who also turned out to be good and evil. The evil twin killed his mother while she was giving birth to him. The mother was buried and from her body grew different kinds of vegetables, which is why she is called “Mother Earth.” Then near the end of the story, when Sky Woman dies, her head, just as in the first version, was used to create light in the darkness. Hence, her name became “Grandmother Moon.” The moral of this version of the story is that “[i]t is the duty of all the people of the world to respect their original instructions and take good care of their Mother Earth” and presents the Oneida Nation’s holistic worldview. This entry was posted in Cora Elm, Tribal Educators and tagged clan, Creation Myth, earth, Five Nations, Haudenosaunee, Iroquois, matrilineal, Mother Earth, Oneida, Sky Woman, turtle, turtle clan. Bookmark the permalink.